On Wednesday, EA CEO John Riccitiello provided evidence — in chart form — that his company published the most well-reviewed games of 2009. Wanting to test his assertions, I dug into the data and found some surprises. The EA chart was shown at an investor's conference, designed to appeal to people who EA hopes will think positively of the company's stock, which is labeled as ERTS. So they show off unusual stats, as you can see above, such as the number of games delayed or not delayed. That sends the message that: You can trust our company to deliver on its promises when we say we will. That's sort of interesting, but how about this idea that EA puts out the most good games? The chart you see above was created by EA and pulls from Metacritic, the aggregator site that pulls review scores mostly from gaming outlets that publish review scores (i.e not Kotaku). EA had gone into the site and counted up the games released between January 1 and November 30, 2009 that scored an 80 average or more. The evidence points to EA not only improving quality year over year — I haven't met a gamer who would deny that — and now leading in quality — which is more controversial. I can see why EA didn't count some of the above 25 in its chart. In fact, I can get to their 19 easily. Let's knock out six listings: 1) Mirror's Edge PC, because it's a port of a 2008 game 2) Burnout Paradise Ultimate Box (compilation of an '08 game), 3) The Sims 3 World Adventures and 4) EA Sports More Active Workouts (which both expand and somewhat require ownership of their earlier edition or edition's peripherals), 5) Left 4 Dead Crash Course DLC and... Well, 6) could go one of two ways. We could not count Rock Band, which EA distributes but doesn't publish, or we could not count the PSP Minis release of Tetris. This is a hefty amount of 80+ games. If we average the full 25, we get this: EA's average 80+ metascore is 85.20. Let's not count six games. We'll include Rock Band but not Tetris. Then we get 85.95. It goes down only to 85.58 if I use Tetris and not Rock Band. Let's see if EA counted its competitors correctly. A little math shows that: Activsion's average 80+ metascore is 89. Better than EA's, but it's only four games, and really, if you want to do a fair comparison of publisher quality, you'd have to do an average of all their games. Also notable is that there was a wide disparity between some versions. I used the highest Guitar Hero score, which was an 89 on the Wii. The game averaged an 85 on the Xbox 360. Moving right along, here's Ubisoft, listed as having only two over-80s by EA. But if you go past EA's cut-off date of November 30, Ubi manages a third. More math: Ubisoft's average 80+ metascore is 86.67 with Might and Magic. It is another publisher with just one 90+ game. THQ time. EA counts four 80+ games. I think they forgot Rocket Riot, an Xbox Live Arcade game. Let's make it five. Result: THQ's average 80+ metascore is 83.2. They had no 90+ games. Then we come to former EA target of acquisition Take Two Interactive, listed as having six games that were at or over 80. I count seven, because I'm including The Bigs 2, which may have gotten a 76 on the Xbox 360, a 68 on the Wii, but got am 80 on the PS3. I do Take Two no favors for the average here by including The Bigs 2, but I did just make them look better by counting it in the overall tally, right? Anyway, Take Two's average 80+ metascore is 85.57. And look! They have two games with a 90 or above. Now we got to Nintendo, a publisher I think a lot of gamers would assume would be the answer to the question posed in the headline. EA counts Nintendo as having had 16 games rated 80 or up this year. I'm with them. One could count a 17th title, the DSi application Flipnote Studio, which, at a 93 score, was the highest-rated software from the company this year on Metacritic, but it is so not a game. You could load up this one with caveats, noting that the Metroid and Pikmin games aren't new, but let's include them. Nintendo's average 80+ metascore is 84 even. Credit them with a pair of games at 90 or above. Let me average that up for you. Sony's average 80+ metascore is 86.6. Not shabby at all. Plus, the company can boast four 90+ games, albeit one of them a compilation of PS2 hits. The final publisher considered by EA was Microsoft. They count six titles at 80 or above. Let's crunch that. Microsoft's 80+ metascore average is 85.83. EA didn't tally the top scorers for Capcom, Sega and Warner Brothers. All had a batch of stellar games, so I figured I'd do the work. Capcom's average 80+ metascore is 85.25. 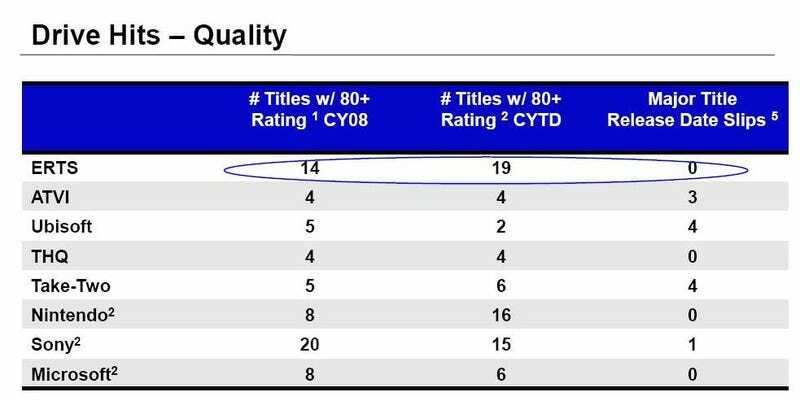 1) While EA had the most games that received 80+ scores, its average score for such titles settled between its two most prolific game-publishing competitors. It beat Nintendo but was beaten by Sony. 2) It's clear that no matter how many well-reviewed games a publisher has, getting an 80-89 score is far easier than getting a 90+. That seems to be the big equalizer among these top publishers. No one makes lots of those and few make more than a couple. So which company made the most good video games in 2009? Probably the one you like the most. But if you want to try using numbers to back it up in 2009, I think you have to go with EA for quantity or Sony for 90+ excellence and a higher average score from its 80+ titles.